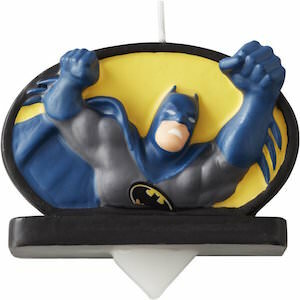 Now there is a Batman birthday candle that makes it look like Batman is climbing out of your cake. The candle shows a yellow shield and in front of that the upper body of Batman and his lower body should be still in the cake. Now you just need to find the perfect cake for you Batman style party and plant this candle on top to make it a true Batman birthday cake. Even a plain cake can easily become a Batman cake all thanks to this Batman candle that just looks perfect for on your cake. 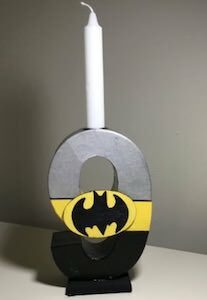 If you or your little one is a very huge Batman fan and their special birthday is coming, then this might be the cake topper for you. 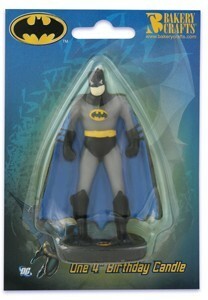 The molded DC Comics Batman birthday candle looks like the original Batman from the 1960’s television series. He has a black boots, gloves, cape and mask. His suit is mainly grey in color besides his black and yellow bat symbol and his yellow utility belt. He stands on a black base that will keep him from falling into your cake. This birthday candle stands approximately 3.5 inches tall on your cake of the day. It has been made by a molding process to create the shape of the caped crusader. Batman is going to keep a good watch on your cake until the time comes to demolish it. Celebrate your big day with the Batman Birthday Candle.